The Brother StampCreator PRO system creates professional, custom designed pre-inked stamps within minutes, including text, graphics, signature, logos, clipart and photos. With the StampCreator PRO systems' proprietary 600 dpi technology almost anything is reproducible. Large business address stamp makes a 7/8" x 2-3/4" impression of your business address to save you time. 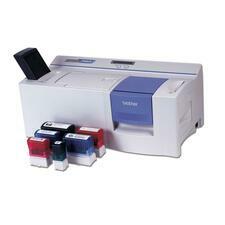 Stamp accommodates up to six lines with 37 maximum characters per line for your business address. Contact customer service to customize. Large inspection stamp makes a 5/8" diameter impression of your inspection mark to save you time. 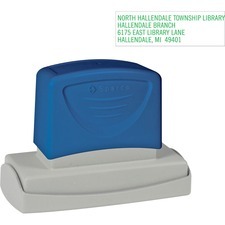 Stamp accommodates up to three lines with six maximum characters per line for your business address. Contact customer service to customize. Colorful, innovative design allows you to store all your stamps in one place. Stamp messages in the set include "Much Improved" with a smiley face; "Please Sign & Return"; and "Terrific" with a smiling sun. All stamps click into the next one to create a unique stack. 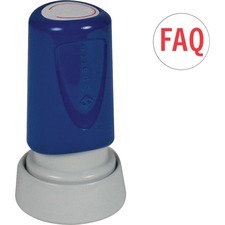 Simply pull the stack apart to access the impression you need and stamp your paper. Use this popular kit as a starting point or buy individual impressions and create your own. You can add impressions to the stack at any time as your needs change. Make crisp, clean impressions with Stamp-Ever ink molded directly into the die so a separate pad is not required. Impression size is 5/8" x 1-13/16". Colorful, innovative design allows you to store all your stamps in one place. 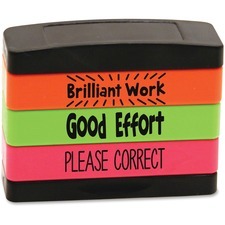 Stamp messages in the set include "Brilliant Work"; "Good Effort"; and "Please Correct." All stamps click into the next one to create a unique stack. Simply pull the stack apart to access the impression you need and stamp your paper. Use this popular kit as a starting point or buy individual impressions and create your own. You can add impressions to the stack at any time as your needs change. Make crisp, clean impressions with Stamp-Ever ink molded directly into the die so a separate pad is not required. Impression size is 5/8" x 1-13/16". 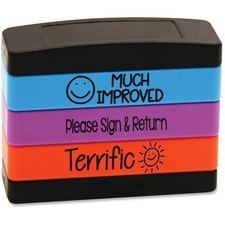 Colorful, innovative design allows you to store all your stamps in one place. 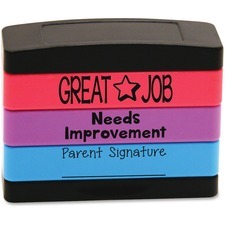 Stamp messages in the set include "Great Job" with a star; "Need Improvement"; and "Parent Signature" with a line for the parent's name. All stamps click into the next one to create a unique stack. Simply pull the stack apart to access the impression you need and stamp your paper. Use this popular kit as a starting point or buy individual impressions and create your own. You can add impressions to the stack at any time as your needs change. Make crisp, clean impressions with Stamp-Ever ink molded directly into the die so a separate pad is not required. Impression size is 5/8" x 1-13/16".